What a great product for the price! Everything was well packaged and was delivered on time! The soft close doors are great and the marble is beautiful. 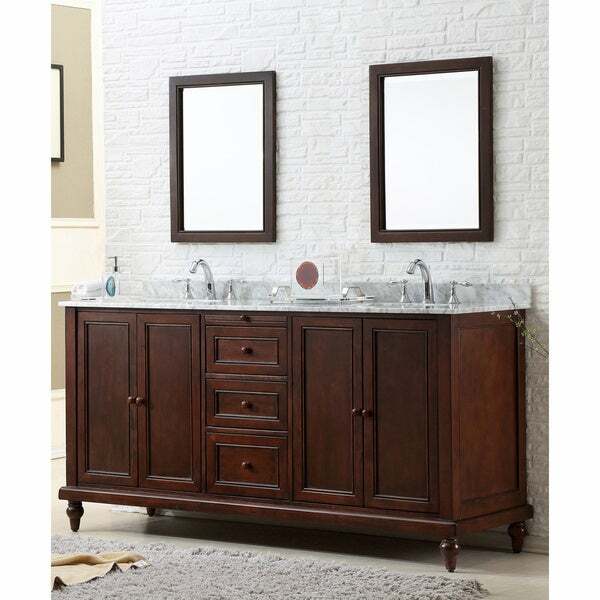 The traditional style of this double vanity cabinet adds elegance to your master bathroom. Seven shelves give you the storage space to organize your grooming accessories. Quality construction shows throughout this wood vanity, even in such extra touches as soft-close mechanisms on all of the drawers and doors. A rich brown finish, marble top and two undermount sinks provide further visual appeal. Solid wood finger joined panel, dovetailed joined drawer boxes on soft closing glides. Concealed, tri-axial adjustable soft closing hinges. Arrive to delivery address within 2 weeks for most states. As an eco-conscience vendor, we sponsor National Forest Foundation to plant trees to offset the material used for your furniture. The size, length, shape, color, and density of veining are natural to stone countertops. It varies from slab to slab. Matching back splash is provided as courtesy without warranty for matching characteristics, missing and breakage. Stone top pre-sealed against water but needs to be sealed again before use. And sealant needs to be applied periodically. Cabinet treated for elevated humidity; but not designed to be in the same room with steam shower. Dimensions 70.0 In. X 23.0 In. X 36.0 In. The vanity is gorgeous! We haven't installed yet, but don't see any issues. When we ordered, we were told that it may be up to a month for delivery, we received it in less then 1 week! It comes very well packaged. The soft close drawers are definitely a plus and we didn't even notice a pull out shelf on top of the drawers until we received the vanity. We purchased the black granite and it its beautiful. The vanity is rich in color and we love the feet! We may replace the knobs to match our faucets etc to pull it all together. So very happy with this purchase!! For less than the price of just a carrara marble top, we got this vanity with carrara top, two sinks and two mirrors. The cabinet is very nice, with soft closure drawers. I will be replacing the knobs because I am going for a unique custom look. Feel like I got a fantastic deal on this item. Very happy with this vanity. It arrived much quicker than expected and was packaged extremely well. We have not yet installed it, but we have uncrated it and inspected it. The marble top is beautiful and the drawers and doors work fine. I love the soft close feature. When the countertop is put on this vanity, it actually measures 36-1/2 inches high. If you are short like us, it is too tall, taller than a standard vanity. The other problem is the sinks are very small and set more towards the back, so I had to bend over to get my face over the sink to avoid getting water all over the counter. We were very unhappy with it, so we cut the feet off and put smaller feet on, which dropped the height a little over 2 inches. Now I can live with it. We also replaced the knobs because the small matching wood knobs it came with are just too small. The whole thing put together just fit in our space. Because the sinks are small, there is more countertop surface. We also scratched one of the cabinet doors while installing it, and the tiny bottle of stain/paint that we found in one of the drawers was useless, all dried up. In preparation for delivery, we received detailed instructions from Overstock to check out the unit before accepting it; however, the guys who delivered our unit would not allow us to. They said if there was no damage to the crate, everything inside would be fine and they literally ran off. Fortunately, there was no damage when we opened it up. I am not being paid for this review because it is not a 5 star review. I renovated my master bathroom and needed a new vanity that wouldn't break the bank. I won't be living in this house for more than a few more years so I didn't need a 'dream bathroom' just something that looks nice and holds up well. I'm confident this will be both. I ordered the white marble top and I'm happy with it, some veining but mostly a lighter cream color. New floors are distressed brown tile so it works perfectly. Drawers and doors are good quality, although I'll probably replace the pulls because they're a little cheap-y looking. Not a deal breaker though. I was lucky to find this on sale and for the price I paid I would order it again in a heartbeat. After looking at vanities in this similar price range at Home Depot and Lowes, I was very please to find that this one is made of solid wood construction. The others were fiber board. VERY pleased with this item. Wish they made it in a 48" size so I could get another for my guest bath. I did not order the mirrors, I opted for medicine cabinets which I did get from Lowes. Absolutely well made - dovetails, solid wood, nicely finished, great hardware and it was well packaged to protect it - not a scratch or mar on it. So glad I chose this vanity. 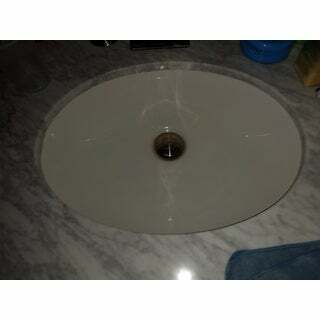 As you can see, the Carrera marble top sink is too small. We didn't realize s till it was installed and glued to the wood. The quality of the furniture is fine, we do like it. There's about an more than an inch that needed to be cut in order to fit right. I have to have it cut one of these days. It may cost us to have that done. When you try to use and turned on the water on the faucet, waters are all over the counter. The sink hole was cut too small.just like for the daycare mini vanities. How can you correct that?. We paid about *** for this item, and probably it will cost us about *** to can and have it cut. That's too much to swallow. This is a gorgeous vanity; it looks like a piece of furniture. It took about 3 weeks to receive it. The freight company left it in my driveway, though. They said I had not ordered the white glove delivery (they bring it inside). So, I had to hire someone to bring it in. So, be aware of this when ordering. Overall, I am very satisfied. I ordered the white countertop, and its a little more 'sparkly' than I anticipated, but still very pretty. I did a lot of research before ordering this, and I am pleased with the purchase. This vanity turned out to be just as beautiful and well made as I had hoped it would be, much better quality and price than anything I had found when comparison shopping locally. The soft close hinges are wonderful! It arrived quickly and in perfect condition. The vanity arrived quickly and well-packed. It was exactly what I expected and wanted. I love that the cabinets and the drawers have the quiet close features. We first saw this on Overstock sometime ago. It was repeatedly sold out. We finally were able to order one. This vanity came extremely well packaged. Once we unwrapped it, we were extremely excited to see how beautiful it is in person. Solid, heavy and beautiful. The woodgrain is stunning. We are in the process of renovating our master bath so haven't installed it yet. But suspect we will love this for years to come. 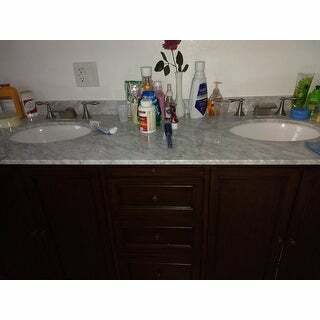 "Our space for a bathroom vanity is exactly 71 inches from wall to wall. Will this double vanity fit? Is your measurement of 70.25 inches for the cabinet only or does it include the countertop which appears to extend a little bit beyond the cabinet?" "Does the vanity top come attached?" The vanity top does not come attached. "I am not able to order one with a beige counter top , the option will not come up. Is it still available? If not when will it be in stock again?" "Please confirm dimensions my opening is 70 inches no more your vanity states 70 is it exactly 70 or a liitle less"
This goes up to 70.25 inches. If you can only use exactly 70 inches, we do not recommend this, as not all walls are completely parallel and will need a bit of tolerance. "This is not allowing me to pick the black top... is there an option to do so?" "Can this vanity be purchased without the counter top?" "What are the dimensions of the optional mirrors?"